What Vitamins Do Blueberries Have? What Are the Benefits of Guava? Guava is a tropical fruit native to the Americas, originating in either Mexico or Central America. While you can eat it raw, guava is more commonly cooked, which destroys its strong odor. Guava is low in calories and high in fiber, vitamin C and vitamin A. Knowing its nutritional value can help you determine how this nutrient-rich fruit can fit into your meal plan. A 1 cup serving of guava fruit contains 112 calories. As a low energy-dense fruit, guava has only a few calories in a large serving size and helps you feel full on fewer calories, which can help with weight management. As a fruit, most of the calories in guava come from its carbohydrate content. A 1 cup serving contains 24 grams of carbohydrates and 8.9 g of fiber. You should get 45 percent to 65 percent of your calories from carbohydrates. In addition to being high in carbohydrates, guava also is a good source of fiber. Fiber is a type of carbohydrate your body cannot digest and offers a number of health benefits including appetite control, alleviation of constipation and improvements in blood cholesterol levels. Women need 21 to 25 grams of fiber a day and men need 30 to 38 grams. One cup of guava meets more than 20 percent of your daily needs. Unlike most fruits, guava contains some protein and fat. A 1 cup serving contains 4.2 grams of protein and 1.6 gram of total fat. Protein in the diet is necessary for growth, tissue repair and preservation of lean body mass. Fat helps you absorb fat-soluble vitamins and acts as a source of energy. You should get 10 percent to 35 percent of your calories from protein and 20 percent to 35 percent of your calories from fat. 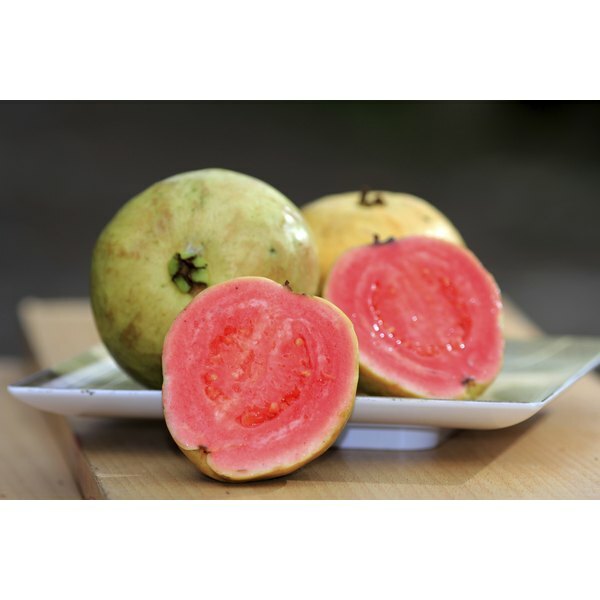 Guava is a good source of both vitamins A and C. A 1 cup serving contains 1,030 IU of vitamin A and 376 milligrams of vitamin C. Vitamin A is a fat-soluble vitamin necessary for normal growth and development, eye health and bone strength. Adult women need 2,310 IU of vitamin A a day and adult men need 3,000 IU. Vitamin C helps with the synthesis of collagen and acts as an important antioxidant. Adult women need 75 milligrams of vitamin C a day and men need 90 mg.
Guava also contains small amounts of calcium and iron. A 1 cup serving contains 30 milligrams of calcium and 0.4 milligrams of iron. Calcium is necessary for bone health, and adults need 1,000 to 1,300 milligrams a day. Iron assists with oxygen transport throughout your body. Adult women ages 19 to 50 need 18 milligrams of iron a day and adult men and women over the age 51 need 8 milligrams a day. How Many Calories Are in Blueberries?